Sounds appetizing, right? After my whole last post about “fake food go home,” I tried to make some raw vegan pizza. Of course. I guess that I consider pizza to be something I NEED. All that cheese and wheat ain’t doing me so good, but the combo of bread-like base + sauce + toppings + cheese (optional) = heaven. Epic once told me, “If I could only ever eat one thing again, it would be pizza.” True dat. 1 t chia seeds? I think? Anyway I obviously don’t remember everything I put in there (thanks drugs!) but I ground it up real fine and spread it out in a big wide round circle on a paraflex sheet. After it dried for about 6 hours, it smelled good. I’ve tried buckwheat crusts before and they get a little chalky and dry. But the texture on this wasn’t awful! However: when I flipped it after about 2 hours, I put it on a mesh sheet. Dumb. Dumb dumb dumb. It started to seep through as it dried, and it kind of… dried around the sheet. This combined with the fact that I spread it a little thin made my crust break when I tried to peel it off this morning! I freaked out for about 30 seconds, but decided to make due with what I had. 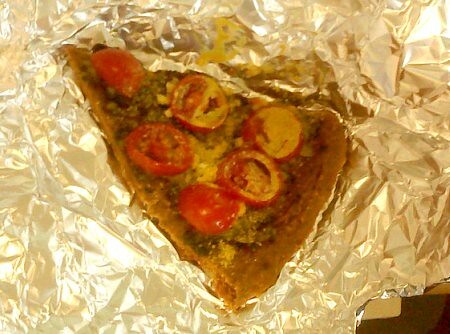 I cut four pizza slices out of what was salvageable and spread ’em with raw pumpkin seed pesto, diced garlic, tomatoes and nutritional yeast. Too bad I didn’t have any daiya. I dumped the rest of the crumbs in a blender with water, more almond butter, a little agave and some more flax. After it was all good and mixed I poured it on a new paraflex sheet (thicker this time) and popped it back in, flipping an hour in. We’ll see what happens.